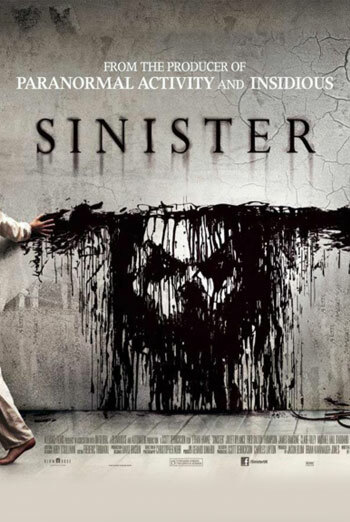 SINISTER is a horror film in which a true crime novelist moves into a house in which the previous residents were murdered. Scenes include flashbacks to previous murders, including a family being hanged from a tree, another family drowning in a pool while tied to sun loungers, and another family having their throats slashed. However, these scenes are presented as if they are on archive film stock and are relatively undetailed. Horror sequences include jump scare moments, such as another character emerging from a cardboard box screaming, as well as scenes featuring ghostly children and a menacing supernatural being. There is also a sequence in which blood is seen smeared on the walls of a corridor and drawings are made from the blood following a murder.